Fill the tortillas with Mexican cheese to create a quesadilla. In a large skillet over medium heat, heat the quesadilla on both sides until cheese is melted. Remove from pan and place on a cutting board. Time to be creative: Cut the edges off the quesadilla to make a rectangle. Cut small squares off the top to create a castle. Finish by cutting out a door at the bottom of your quesadilla. 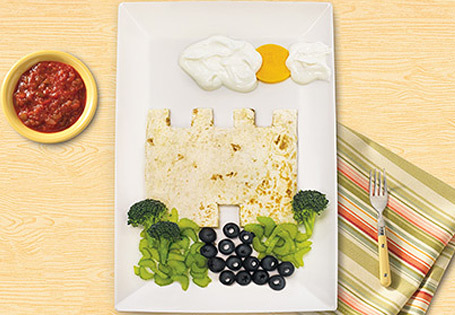 Place the CastleDilla on a plate; layer the celery at the foot of the castle to create grass. Make a path from the door of the castle to the bottom of the plate with the black olives. Cut a circle from the slice of American cheese and place it above the castle for a sun, cover half of it with the sour cream and spread it out to form a cloud. Place the broccoli florets around the castle for bushes and trees.